The Agency provides information on the quality of higher education by publishing on its website the review reports, the system-wide analyses and highlighting best practice. It provides the heads of the institutions reviewed and the Government with proposals on ways of enhancing quality. The Agency, through its broad-based participative structure, remains in permanent dialogue with stakeholders. It takes any initiative deemed fit for accomplishing its duties, updating its procedures on the basis of experience gained. Its participation in international bodies and events for quality assurance in higher education are also to be seen in the context of the Agency as a learning organisation. 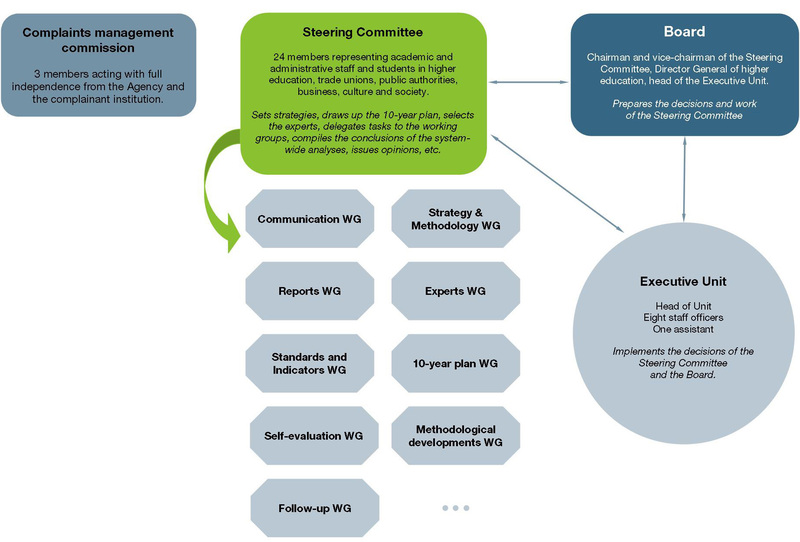 By basing all its working procedures on the European Standards and Guidelines (ESG), by working together with other agencies or bodies in other countries, and by disseminating information on European developments in higher education, the Agency can be seen as being a part of an overall European process. The Agency’s Bodies are the Steering Committee, the working groups, the Board, the Executive Unit and the Complaints Commission. AEQES wanted to express all its actions and considerations with an overarching coherence, through a strategic plan. The purpose of this plan is to shed light on the AEQES’ missions, vision and values underlying its current and foreseen activities, and to state them in a clear way for all stakeholders.